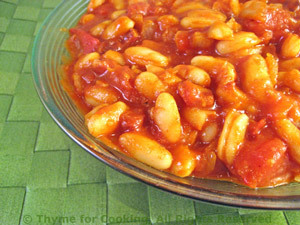 Alubias con Tocino (Beans with Bacon), Thyme for Cooking side dish. Add tomatoes, tomato paste, stock, beans and bay leaf. Simmer, uncovered for 15 minutes.